After leaving Ford, Richards was a consultant at J.D. Power and Associates and then joined Trilogy Enterprises Inc.
DETROIT -- General Motors Co. today said a former Ford Motor Co. executive will run the Buick and GMC brands. Michael D. Richards, 52, worked for Ford for 27 years before leaving in 2008. Richards, who replaces Susan Docherty, capped his Ford career as general marketing manager for Lincoln Mercury from 2006 to 2008. After he left Ford, Richards was a consultant at J.D. Power and Associates and then joined Trilogy Enterprises Inc., a Texas company that provides sales leads to automakers and other companies. At Trilogy, Richards was vice president of marketing and sales for global automotive business. 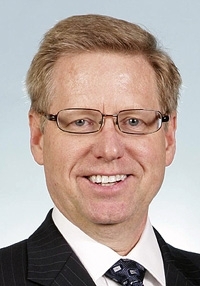 GM promoted Docherty to vice president of U.S. sales in October. GM’s U.S. sales fell 2 percent in November, the company reported today.